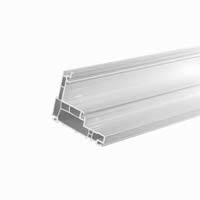 System 1400 PVC casement window casement design has a C-C75 commercial rating. Features include a contoured millwork appearance and a triple-glazing option. The ability of the window design's casement sash to accommodate a variety of insulated glass sizes enhances the sound abatement properties required for an STC 40 rating. In addition, its DP-75 and C-C75 rated durability affords use in commercial applications without requiring profile reinforcement (up to a 36-inch by 60-inch size [914.4mm x 1524.0mm]).